Based on the film written and directed by Charles Dance. Set in Cornwall in the mid-1930s, the play tells of two ageing spinster sisters, Ursula and Janet Widdington. Their lives are turned upside down when they discover a young man washed ashore on the beach, close to death. They nurse him back to health and discover he is a talented Polish violinist, on his way to seek a career in the USA. Despite her sister?s concerns, Ursula falls in love with Andrea. It leads to a journey of discovery for her and a poignant ending. 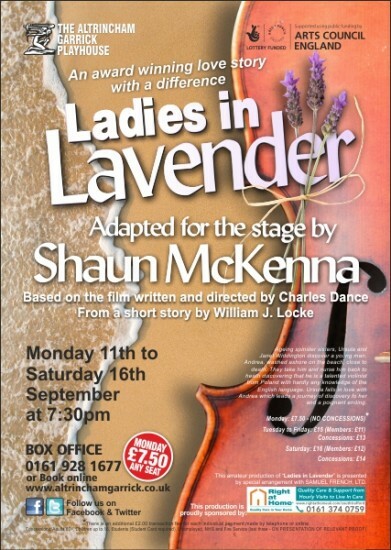 LADIES in Lavender, is, thanks to a new Garrick sound system, awash with echoes of the sea. It also enhances Nigel Hess’s original film music. The first play of the season, is Shaun McKenna’s stage adaptation of the 2004 film. Set in Cornwall before the Second World War, it’s about two single sisters set in their ways in their seaside cottage. Things change when Andrea (Chris Wagstaff) a Polish violinist is washed up on their beach. 20-year-old Chris captures the sensitivity of his character and genuine affection for the sisters who rescue him. His presence provokes rivalry between the siblings. Ursula and Janet Wittington. Margaret Leslie and Mags Johnston show how the years roll away with the young man’s presence. Mag’s Janet, is the obvious leader of the two whilst Margaret’s Ursula is comparatively naive. The sisters convey undercurrents of emotion in subtle ways which makes their performance exceptional. Then Olga, a Russian appears. Played by Fiona Primrose, her accent is near perfect and she, too, casts her spell. The local doctor (John Keen) fancies her. Ruth Metcalf’s Dorcus, the housekeeper adds colour and humour. Her straight talking contrasts well with the others. Barry Purvis, the director and designer, encourages the essential interaction between characters and devises a three tier set with jetty which will long be remembered. LADIES In Lavender is a story told with the most gentle brush strokes and it really does play on your emotions, without trying to do so. Two sisters, living together in their dotage, have their lives transformed when a handsome and charismatic young man enters their lives. He”s foreign too, which adds to his appeal. We also have the widower GP Dr Henry Mead, a respected and well known figure in the Cornish village he so dutifully serves. His affable nature hiding his loneliness. What a pity then, he’s drawn to that study in aloofness, Olga Danilof. I was overcome with excitement when I heard Barry Purves was directing and designing this production for Altrincham Garrick. Not only has he coaxed some memorable and moving performances from his cast, he’s also created a set equally deserving of the audience’s applause. The Garrick are so lucky to have him and his bottomless pit of creative skills. Mags Johnston and Margaret Leslie exhibit a natural and convincing chemistry as sisters Janet and Ursula Widdington, trapped in a safe, dull domestic routine. Chris Wagstaff, who is only 20, delivers a performance way beyond his years, yet again, as their mysterious house guest Andrea Marowski. If Chris wants to turn professional he has the talent to do it. John Keen delivers a beautifully understated performance as the disarmingly decent Dr Henry Mead, not the only lonely heart in this engrossing piece. The role of Dorcas, the sisters’ straight talking housekeeper is a gift for Ruth Metcalfe and Fiona Primrose has quite a presence as Olga Danilof. But you’re certain to hate the way she treats the nice Dr Henry. Once again Altrincham Garrick sets the standard but really, what do you expect with Barry Purves at the helm? Unmissable, a triumph. Directed and designed by BARRY JC PURVES with music by Nigel Hess. This amateur production of ?Ladies in Lavender? is presented by special arrangement with SAMUEL FRENCH LTD.